I had just posted a photo online of some wild berries I was going to preserve, when suddenly I was inundated with messages: “Are those really safe to eat?” “I thought those were poisonous!” “We’ve had those for years, and I never knew I could eat them!” What surprised me most was that the majority of these messages came from people living in my area " a region rich with wild berries, whether you live near the pavement or in the woods. Many people have no idea they are surrounded by free, nutritious, delicious food " but the good news is that it just takes a little time and know-how to acquire them. If you can’t positively identify a wild plant, you should never eat from it. But how do you learn which wild berries are safe to eat? • Grab some guidebooks. To be truly useful, plant identification books should focus on your specific region and have color photos to help you identify plants. If money is tight, check your local library for such books. If they don’t carry any, ask a librarian to fill in this gap in the library’s collection. • Use the Internet in conjunction with guidebooks. For example, if you think you’ve identified a certain type of berry by using a foraging guidebook, hop online and search for additional information and pictures. An excellent place to start is your local university extension office website. • Consult your local extension office in person, on the phone, or via email. Experts there can help you identify local, edible berries " and they may even supply recipes for eating and preserving them. A good approach is to take photos of the plant in question: the whole plant, a closer image of the leaves, and an image of the berries. If you prefer to go to the extension office in person, bring a branch from the plant that includes both leaves and berries. If you live in a city or the suburbs, look for berries at parks, on the edges of parking lots, at rest stops, and around athletic fields. Be sure these areas have not been sprayed. 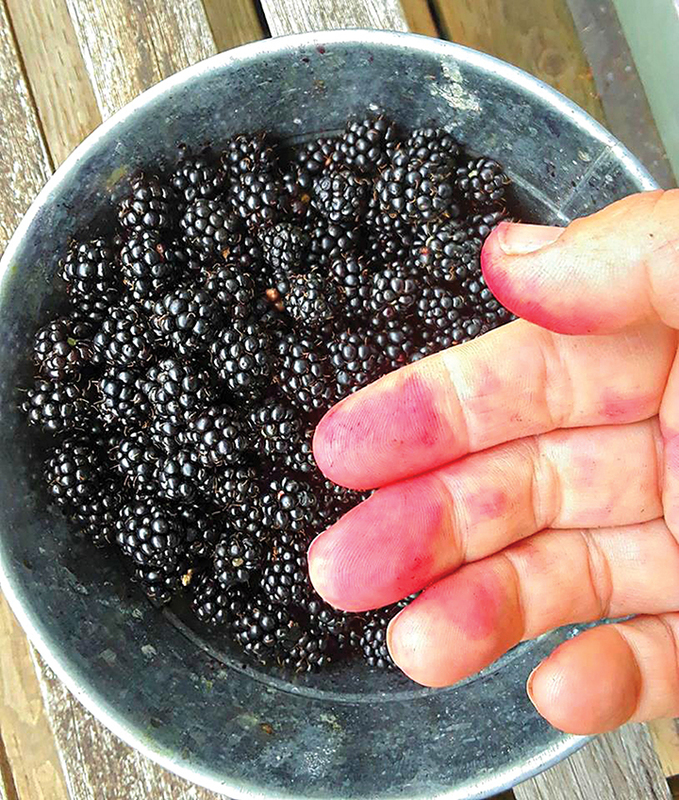 State parks are often an excellent place to begin your wild berry search. (In most states, it’s perfectly legal to pick berries at state parks, as long as they are for your own personal use.) I recommend talking to a park ranger; not only can he or she explain any local laws about foraging in state-run parks, but often a ranger can give tips on where to find good patches of berries. In rural areas, seek out the edges of forests, or openings within the woods that offer enough sun for berries to grow and thrive. Remember that berries can creep along the ground, grow on a vine or bramble, come from a tree, or grow on a bush (which may or may not be as large as a tree). Some berries can be harvested in spring or fall, but most are ripe in summer. 1. Don’t wander onto private land. If you pick berries on someone else’s property, it’s stealing. On the other hand, it’s fine to knock on someone’s door and ask if you may pick berries on their land. The kind thing to do is to offer some of the berries you pick to the landowner. 2. Avoid picking berries near the roadside or railroads, where they may be contaminated by pollution, or anywhere that might be sprayed with an herbicide or other chemicals. 3. Don’t hoard. Leave some berries behind for other foragers and wildlife. Leaving some berries behind also allows the plant’s seeds to spread, ensuring future crops. Where there are berries in wilderness areas, there are almost certainly bears. This is a good reason to take company with you, to talk loudly as you tromp about, and to bring a gun. Containers: A small bucket with a handle, like the type used for ice cream, is about right for most berries. Anything bigger than that, and the berries on the bottom tend to get smashed. A container with a handle can be looped over one arm, freeing your hands for more berry picking. Some serious foragers fashion baskets or other containers with a strap to go around their neck so their hands are free. Gloves, long sleeves, and a hat: Berry picking often takes place during hot weather and I’d rather get scratched by briars than become too hot from wearing protective gear. But if you’re not like me, you’ll want clothing that protects you from briars, sun, and bugs. Bug spray and sunscreen: Use whatever you like to keep ticks and other bugs away. To prevent bites, I usually just dab tea tree oil on my wrist pulse points, the pulse points on my neck, the back of my neck, and at the top of my boots (which have my pants tucked into them). Scissors or garden clippers: These can be handy for berries that are easiest to pick in clusters, like salal or elderberries. Berry picker: I’ve personally never used one, but if you want to get some serious berry picking done in a short amount of time, a homemade or store-bought berry picker is something to consider. However, because berry pickers are indiscriminate, plucking unripe and rotting berries, as well as good, ripe ones, you’ll spend a lot of time at home sorting berries afterward. Water: Carry your water hands-free by putting your bottle or canteen in a backpack, fanny pack, or large pocket. Blackberries: When ripe, blackberries are always black. However, there is a stage where they are black and very, very sour, so it’s a good idea to taste a few before you harvest bowlfuls. It takes some summer heat to get blackberries truly ripe. The biggest problem with picking wild blackberries is their thorns, which are irritating to the skin and can cause (usually mild) allergic reactions in some people. Either embrace this annoyance or dress in long sleeves and leather gloves. Raspberries: These can either be red or black. Once they are picked, all raspberries have a hollow cup in their center (as opposed to blackberries, which don’t have a cup). 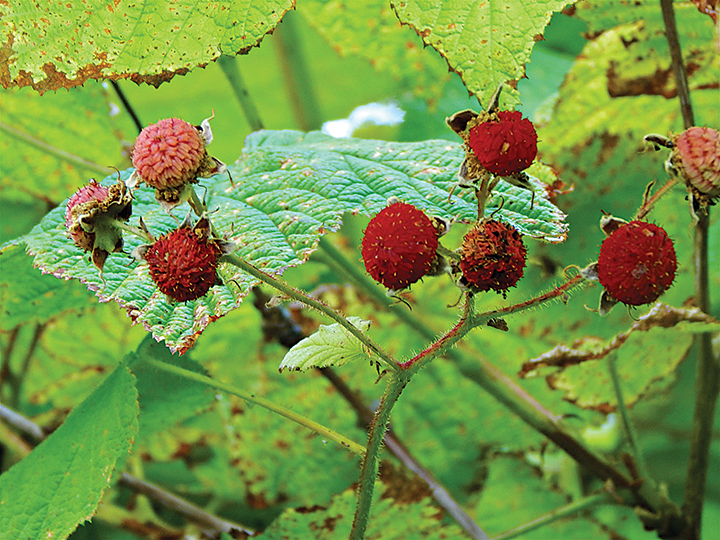 Wild raspberry plants are thorny. Strawberries: Wild versions of the strawberry are very small, but packed with sweet flavor that makes store-bought strawberries seem bland. They usually grow in patches. Salmonberries: These look a lot like raspberries, including their hollow cup, but may either be peach-colored or red. 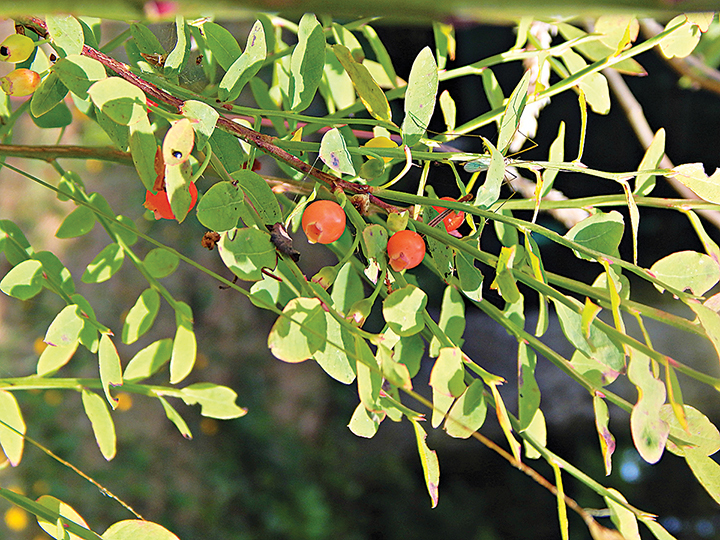 These berries are quite perishable and should be eaten as soon as possible. Cranberries: Tending to grow in boggy areas, these look very much like store-bought varieties. They ripen in the fall. Blueberries: Wild versions are reddish or purple-black and grow on low bushes that spread in carpet-like masses. When ripe, they typically have a whitish “frosting” on the outside of the berry. 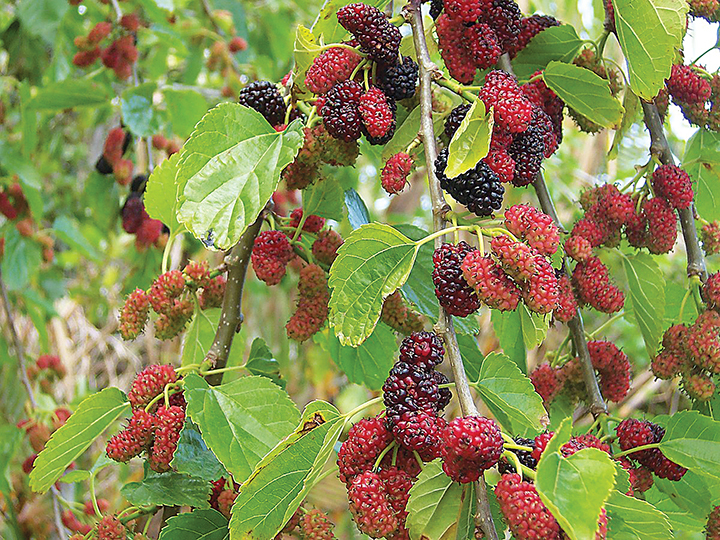 Mulberries: These grow on trees or bushes and are either red, black, or white. The berries themselves resemble elongated blackberries or swollen loganberries. Loganberries: Looking like a red blackberry, loganberries grow on prickly brambles. They are fully ripe when dark red and should be eaten soon after picking. Salal: These bushes tend to grow in coastal areas. When the fruit is ripe, it’s black and not fully firm to the touch. For the easiest picking, pluck off whole stems and pinch berries off the stems when you get home. Thimbleberries: Looking and tasting similar to raspberries, thimbleberries are highly delicate. After picking, eat them as soon as possible. They grow on thornless canes. Dewberries: Many people mistake these for blackberries, because the fruit looks similar. However, dewberries grow on a low vine that trails, whereas blackberries grow in dense brambles. Huckleberries: There are many varieties of huckleberry, depending where you live. All of them grow on bushes and some bushes can be the size of small trees. Huckleberries are tiny " it takes a lot of picking to get enough huckleberries to make pie or jam. The berries are either black, blue-black, or red. Gooseberries: This unique berry grows as a shrub and produces green, yellow, black, red, or gray-green (called white) fruit. 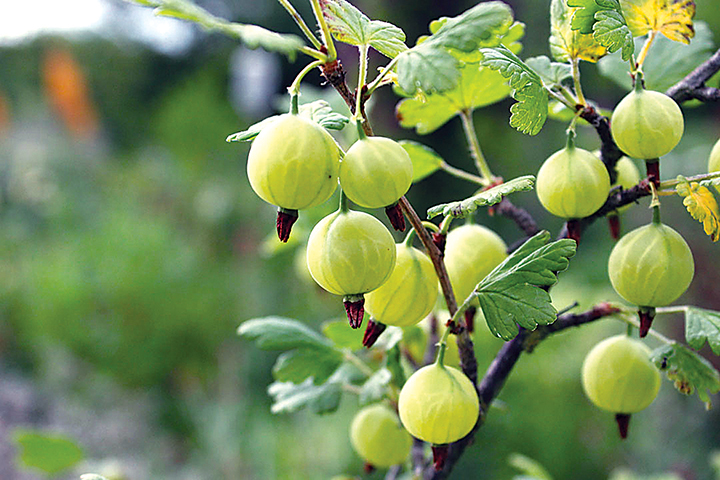 Some gooseberries are as big as small plums, but most are only about half an inch long. American gooseberries are round; lighter-colored berries are somewhat translucent. 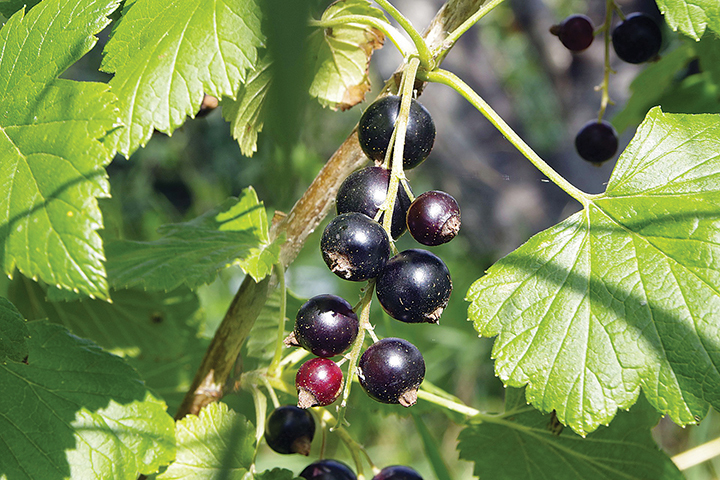 Currants: Related to gooseberries, currants are either red, gold, or black. They grow on a shrub; if you break off a stem and smell it, it has a skunky scent. Chokecherries: Chokecherry fruit grows in clusters. The berries are shaped like a sphere and are only about one centimeter in size. They can be black, red, or white. Elderberries: There are a number of species of elderberry. The red type is erroneously (but widely) considered poisonous, and is medicinal if cooked properly. (Please see Stephen Buhner’s book Herbal Antivirals for complete instructions on how to use all types of elderberry safely.) For eating, the black and blue types are used. When harvesting, it’s easiest to snip off whole clusters, then pinch off individual berries when you get home. Raw elderberries may cause digestive distress, so it’s best to cook them into a treat. The easiest way to eat berries is the way nature intended: fresh, all by themselves, as a snack or dessert. But they also make a great topping for yogurt, cereal, or ice cream, and of course can be made into pies, jams, and other sweet treats. All berries are easy to freeze for future use. Simply lay them in a single layer on a rimmed baking sheet and pop the sheet into the freezer. When the berries are frozen, transfer them to freezer bags. 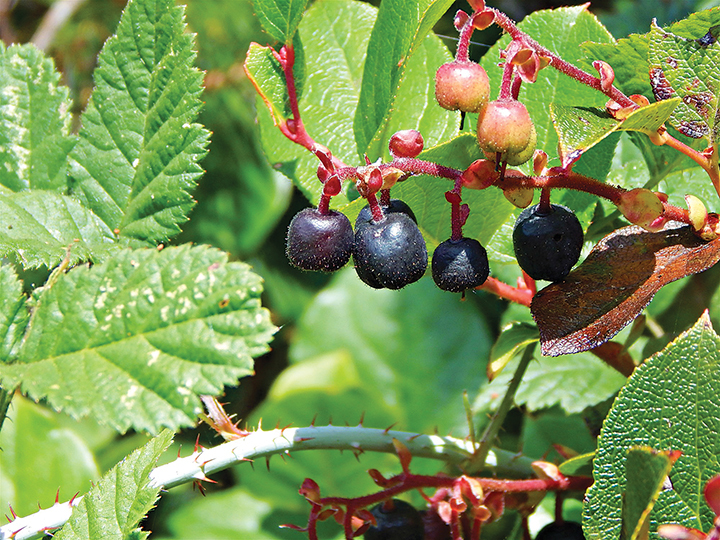 Kristina Seleshanko considers wild berries an important part of her homestead’s food supply. She’s the author of 25 books, including The Ultimate Dandelion Cookbook, and she blogs at www.ProverbsThirtyOneWoman.blogspot.com. I remember picking buffalo berries with my mother as a child. They are tiny bright red round berries, tart and full of vitamin C.
They were found in the Garlands of North Dakota.